Plastic Lumber Installation Considerations – Resco Plastics, Inc.
A little innovation and creativity in engineering lets you apply recycled plastic lumber to the areas of your business or industry that require a product with increased durability and strength. Following are a few tips to help control and decrease the effects of expansion and contraction. Plastic lumber must be gapped end-to-end, based on the length of the boardand temperature at installation. This will allow for the expansion ofthe material in warmer temperatures and the contraction of thematerial in cooler temperatures. 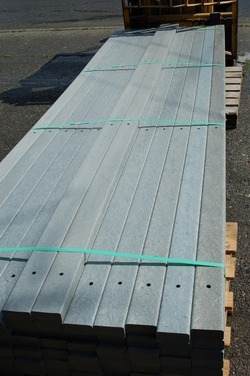 You can expect that a 12ft boardwill expand 1/8” on each end when installed at 60°F based on anexpected increase of 40°F. Therefore, in this example, you would gapthe boards ¼” in end-to-end installation. Properly installed deck systems include hidden gaps and clips to allow for this expansion and contraction. Installers are responsible for installing the materials in a manner that accounts for this natural expansion and contraction. In very hot or very cold weather, installers should anticipate that the material will be at the larger or smaller range of this expansion or contraction and adjust gaps accordingly. Installers should make sure that materials have been allowed to adjust to the ambient temperatures before installation. Normally this means leaving product open to the air at the deck site for approximately 24 hours. To withstand the expansion and contraction as well as to maintain a long lasting, stainless steel screws should be used, preferably #10 x2½ (#10 x 6.5cm) or 3” (7.5cm) long, square drive stainless steel deck screws. Each deck board should be fastened with at least 2 screws per joist. Screws must be pre drilled and should be countersunk. Also coating the screws with a lubricant, such as a silicone caulk, or soap will ease installation. 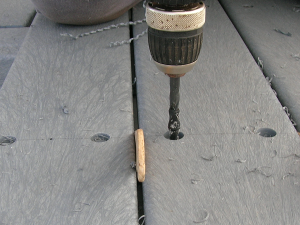 All screws should be a minimum of ¾” (2cm) from the edge or end of the board. All of our plastic lumber is low-maintenance and easy to clean. The closed molecular formula used to manufacture our recycled plastic protects your plastic deck against mildew, mold, rot and insects. Plus paint, ink, and other substances will not permeate the plastic, which prevents permanent staining. Pressure washing is also a good idea from time to time to remove built-up dirt and debris. When using a pressure washer, do not exceed 1800psi with a 20-degree nozzle. The essence of the Mold/Algae problems lies in there being available food for the mold or algae to grow. As Plastic lumber is like the Saharan Desert to microbes, hosing off the deck at regular intervals helps reduce the amount of available food sources for these pesky pests. Plastic lumber has minimal impact on the environment since it eliminates use of our scarce wood resources and keeps material out of the incinerators and waste stream. An estimated 12% of the U.S. solid waste stream is plastic, and 19% of that is high-density polyethylene (HDPE). More than 750 recycled detergent bottles and milk jugs are used to make a single four foot long plastic bench, thus providing an end use for materials already in the waste stream.